These are linked to the composition of the cements and to the corrosive nature of the water with which they come into contact. Cement composition is primarily based on silica, lime, alumina forming various silicates and, to a lesser extent, iron, magnesia and alkali. This composition defines a medium that is usually very alkaline and that comprises a high reserve of solubilisable salts. When cement, and particularly Portland cement, goes off, it releases large quantities of lime in the form of Ca(OH)2, and tricalcium aluminate, «C3A», is formed. Table 9 indicates the levels of the main constituents found in various cements. bacterial corrosion with the formation of H2S. Carbon dioxide will attack structures in the presence of fresh water or as soon as the CO2 content rises above 15 mg · L–1. However, this remains a superficial attack and will not jeopardise structural longevity. In effect, the bicarbonates produced by the action of the CO2 on the concrete’s lime (Portlandite) will in turn combine with the lime to produce calcium carbonate which will increase the compactness of the concrete and slow down deterioration. ban abrasive cleaning systems such as pressurised cleaners. This attack will be all the more severe as the calcium salts formed become more soluble. Rising corrosivity will be found in the presence of the following acids: phosphoric, sulphuric, nitric, hydrochloric. Organic acids are equally harmful, especially in dairy farm or fruit juice production effluents. When faced with moderate levels of acidity, corrosion resistance can be enhanced by reducing the water/cement ratio and/or using aluminous cements (which are also much more difficult to use). This comment applies to pH upper than 2 and subject to certain precautions. However, as a rule, there is often the danger of structures cracking if total protection can only be guaranteed by the use of the right coating. Additionally, a number of legislations on the discharge of wastewater recommend maintaining the pH of water circulating in contact with walls at figures of between 4.5 (or 5.5) and 9.5.
by releasing ammonia that has been displaced by the lime that increases its solubility and causes the cement to deteriorate. Magnesium salts can generate the same process (forming Brucite: MgO, H2O). Therefore, we need to avoid excessively high concentrations of NH4 and of Mg, especially when sulphates are also present. In the presence of magnesium oxide, the decomposition of the cement’s alkaline silicates can also be added to the two previous mechanisms. The AFNOR FD P 18-011standard defines the aggressivity categories for saline water with regard to conventional concretes (table 10) together with the principle behind protection measures. In the case of very highly aggressive water (XA3), we recommend using a coating whereas, in the case of highly aggressive water, the use of a blast furnace cement with a high hydraulicity index can be considered providing, however, that no other water chemical parameters need to be taken into account. blast furnace Portland cement 35 to 80 (CHF) with 60-75% clinker. 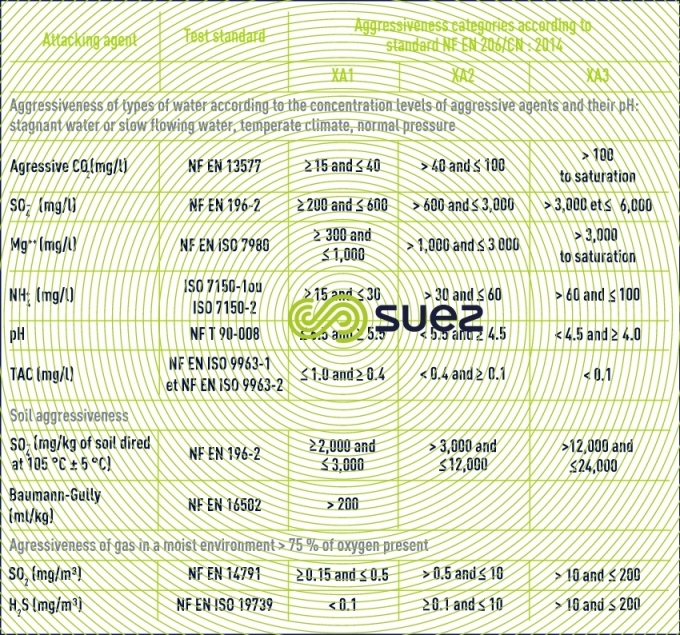 There are also various low «C3A» content cements for use in the presence of seawater. This type of attack is damaging to all cements because of the danger of solubilisation of some constituents of the amine base; in the absence of any coatings, we recommend not allowing water with a pH in excess of 12 to come into contact with the cements. oxidisation of H2S in the presence of air and formation of H2SO­4. As soon as the pH drops below 6, these reactions will accelerate and take place all the faster as water becomes hotter. In the sewers, the attack occurs above the water/air interface because of water condensation and degassing. Adding an oxidant (H2O2), a precipitating agent (Fe2+) or nitrate will more or less totally prevent this H2S from forming.